Are you attending mediation in relation to your parenting or financial matters? Meditation is a great opportunity to obtain an outcome that is tailored to your needs and preference while saving time, money and stress that is involved with going to court. The key to a successful mediation is preparation by both parties, their lawyers and an experienced family law mediator. By preparing for mediation you can help maximise the chances of getting a favourable outcome. 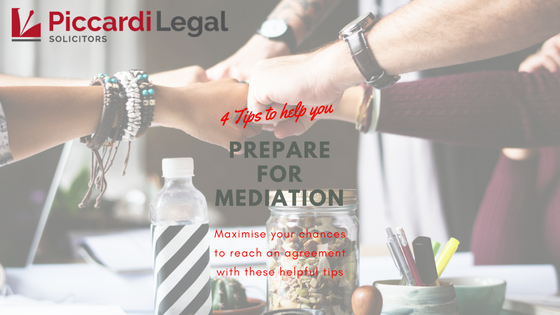 Here are our 4 tips to help you prepare for a successful mediation. Before you attend mediation you should obtain legal advice about the family law process, how mediation will work and your best and worst case scenarios. Prior to mediation, write a list of what it is that you want to achieve from mediation. When you have written your list read over it and prioritise the issues in order of importance. Think about why they are important to you so that you can explain your reasons in mediation. Work out what outcomes you can live with and what outcomes you cannot. Consider what the other party may want out of the mediation and identify the potential road blocks that you may face. Brainstorms ideas way to move past those road blocks and consider what you might be willing to compromise on.Be prepared to negotiate and compromise. If you are not prepared to compromise, your matter will not resolve at mediation. It is normal to feel emotional and stressed in the family law process. You may be feeling hurt, angry, stressed and/or anxious. You can work through these emotions by talking to a trusted family member, friend or someone who is not a party to your proceedings. You may even find writing down your feelings helpful.During mediation avoid pushing the other parties buttons, a favourite saying of mine is “Respond don’t react”.If you are starting to feel overwhelmed in the mediation you can ask the mediator for a break so that you can get some fresh air and gather your thoughts. If you are trying to resolve a family law dispute or you are attending a mediation contact us today to arrange an initial consultation to discuss your matter in detail.